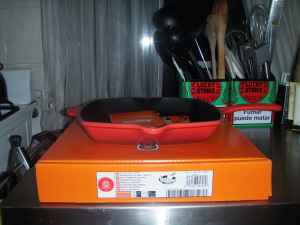 I saw your ad on Craigslist for the Le Creuset square cast iron skillet http://newyork.craigslist.org/brk/hsh/2163711687.html. You claim that it is "brand new and still in the box". BUSTED!! I analysed the photo you included and there is very strong evidence that the pan is not in fact "still in the box".